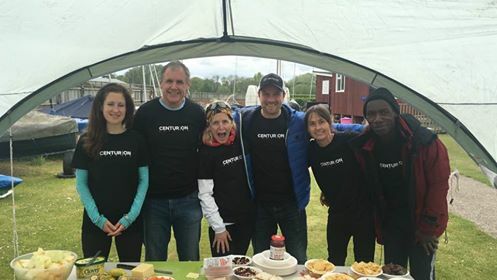 It felt like a lifetime when I first signed up to volunteer for this Centurion event and then the time came and went so quickly. Knowing I was going to have a heavy year racing and intended to run the South Downs 50 (never happened in the end due to Glandular) and a week after London marathon. Anyway, it would be good to know what it feels like to be on the other side and with John who I regularly run still not on form and my Best pal Jo the best volunteer/marshall you have a good team in place. This is a “runners race” organised by a runner was the feedback I heard many times. With Alex not feeling well Phil joined us to do the timing for the aid station at Cookham. Starting from 1.30pm onwards setting up our aid station with the crew we had Barry, Steph, and Cat onboard. First runner through was not as expected Mark Denby, he had been leading all the way for at least 30 miles but the man in second place at the time Michael Stocks who eventually went on to win the race in a fantastic time of sub 15hrs. Sadly for Mark he was struggling with an injury in hip/hamstring and had to call time on his racing at mile 38 and our station. We didn’t have time to talk with the steady flow of runners as the hours ticked by. It gives you a realization on how much goes into the race, all walks of life including walkers wanting to make the cut-off, runners looking to improve on their previous race time and then newbies. As the main Aid station manager, I flittered between 2 main duties which involved filling up competitor’s drinks and then acting as additional support for timing. It became obvious a few hours in that you needed to be out on the path helping direct runners in and taking note of numbers for timing needs. Time did fly by and the gaps became bigger between the runners. The slower runners at the back end of field spent more time in aid stations were longer, chatty and all with personal journeys which I am full admiration for and reminds me how special I felt last year. For all of us as runners who also marshal/support other races but much shorter this was a great experience and I have always respected the marshal role but for me it was good to be part of a very well organised race, meet the runners and the volunteers. Leading on from this as we packed upon arrival of the last runner and the sweeper we helped send the lorry on its way to the next aid station after the Cut-off had been and gone. Sunday 30th I then did the second sweep to check everything was off the riverfront and picked up to ensure the race can return the following year. All I can say is a thoroughly enjoyable experience, as is always a great event and for all of us positive to give something back. This made me want to get back on the course for next year to break my course record and remind me that a lot goes into event management. Cat Simpson, John Dooey, Sam Amend, Barry Collins, Jo Smith, Phil Stephens.